What Abstract Expressionist artist painted this? Jackson Pollock? Actually, the photo depicts amyloid plaques, a frequent topic in the context of Alzheimer’s disease. Pathologist William Lewis‘ photo reminds us that amyloid can also appear in the heart. Amyloidosis of the heart is a set of complex diseases caused by the accumulation of cellular proteins that form an amyloid plaque. Although http://www.oakleyonorder.com/ amyloidosis was described more than 100 years ago, the causative proteins were not identified until recent chemical analyses were conducted. 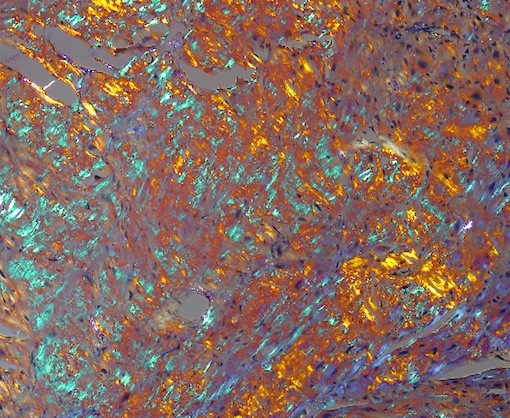 This image shows an amyloid plaque stained with Congo red stain and viewed through a polarized lens. The optical properties of the amyloid-forming protein cause it to appear green, while other matrix materials within the plaque appear as orange and blue. The photo, which was one of the winners of the FASEB (Federation of American Societies for Experimental Biology) 2013 BioArt competition, was featured on NIH director Francis Collins’ blog this week.